Letting your dog leave a pile of poo in your neighbor’s yard is not nice. Not picking it up is even worse. But making an excuse and calling it fertilizer is the worst thing you can do. Not only is it unsanitary and can potentially start a neighborhood feud, it is also wishful thinking to call dog poo a fertilizer. Unlike cow or horse manure, dog poo is primarily protein-based which also makes it high in nitrogen. Cow or horse manure is low in nitrogen and is vegetation-based so that is why it can be used as a fertilizer. The high nitrogen protein-base of dog poo has the opposite effect. It is harmful to your grass and plants. Dog poo can also transfer illnesses to people. So be sure to pick up regularly from your yard and always pick it up when your dog leaves their little (or big) gift while you are out and about. Some people use the plastic grocery bags to pick up the dog poo, but you have to worry about holes being in the bag. Some people buy dog poo bags. They come in fashionable colors now too which almost makes picking up dog poo fun. I like to use diaper bags from the dollar store. For a dollar, you get a pack of 100. And they have handles which make it easy to tie up. They are not as big as other dog poo bags but I find that they work well enough for my 55 pound and 60 pound dog. Remember, dog poo can be unsanitary and it is not fertilizer. 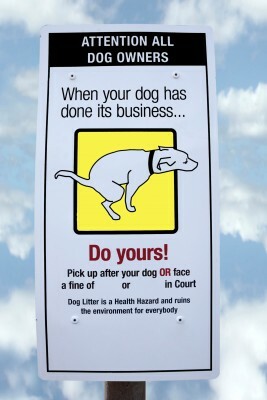 So pick up after your dog whether it is in your own yard or around the neighborhood. Visit other blogs for the Saturday Blog Hop at TwoLittleCavaliers. Share? I don't think so. Actually, Sephi will share with me and other family members without protest, but she won’t share with Maya! We are now on Twitter – Come follow us @naturebydawn. 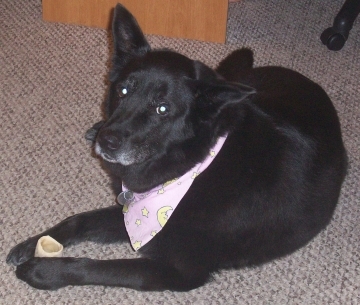 To visit more blogs for Wordless Wednesday visit the AllThingsDogBlog. Dogs are a unique gift to mankind. Not only do they provide us with unconditional love and companionship but they help us with a variety of tasks. Dogs protect our soldiers by sniffing out bombs and acting as guards. They help the disabled by acting as guides, alerting seizures, performing tasks, and providing therapy. Dogs also act as police dogs and assist in search and rescue. No animal provides as much variety of dedicated and loyal service as the dog. And as such, these tireless heroes deserve to be honored. Be sure to watch the American Humane Association Hero Dog Awards on the Hallmark Channel on Friday, November 11th at 8/7 central. Louis Pollaro with his dog Yoshi is on a mission to rescue abused and neglected animals. As a professional cinematographer, Louis Pollaro films each wonderful animal and its journey from a pitiable existence to a whole new and happy life with a loving family. The web TV series is available on PetCommando.com, BlipTV and iTunes. Documenting the rescue of an animal enlightens people to the realities of animal abuse. It also makes us aware of just how many animals there are that are in need of good homes. Please visit PetCommando.com and join the community. Donate to the cause of helping animals, check out some great videos and information, and tell us your story of a rescued dog or cat. “I will stop and render help to the helpless lost, abused and abandoned pets. I will not ignore them or expect someone else to help. There are lots of things to be concerned about when it comes to dogs and Halloween – keeping dogs away from the Halloween candy, saving your dog from the stress of seeing all the strange scary people in Halloween costumes, and dressing up your dog in a Halloween costume. While everyone is posting about these things, we thought we would try to do something a little different. My first experience at a pumpkin patch was very enjoyable. I lived in a small town near the country when I was a child but it was nothing like being on a farm. Visiting a pumpkin patch was like visiting a different world. There were lots of animals, fields of pumpkins where I could pretend I was Cinderella, and delicious country food. I think there was even a hay ride! Last year, I discovered that some pumpkin patches will allow you to bring your pet. If I had known that, I would have taken Maya. Now is my chance! But before I bring her, I need to seriously consider whether it is the right thing to do. How will she behave around children or other dogs? How will Maya behave with the farm animals? Can I be certain that I will be able to control her? Will she be a nuisance for other people? Considering Maya’s personality, I am fairly certain that she will be fine with the other animals. She had never seen a cat before she went to my mom’s and she approached the cat with intelligent caution. I am hoping she will do the same with livestock and chickens. Sephi is not going to be able to go because I am not certain of how she will react to horses, goats, cows, or chickens. She has seen a horse before and she growled and cowered behind me. Maya’s harness allows me much greater control of her than a leash would. Her harness wraps around her legs so she is not able to pull with her neck or chest. She may want to act out, but she won’t be able to get far. The final question, will she be a nuisance? That is not so easy to answer. Maya loves people and will no doubt be very excited about the whole adventure. But after a few minutes she eventually calms down. She is getting better at it as she gets more mature. Perhaps if I take her with me, I will stay at a distance in the beginning then work my way in. If taking Maya is so much work, why will I even bother to take her in the first place? Because how else will she learn to be a good dog in public if I don’t take her places? And because I know that she will really enjoy the experience. Hopefully, I will get to visit a pumpkin patch soon. If I do and if I take Maya with me, I will be sure to share it on a Wordless Wednesday. 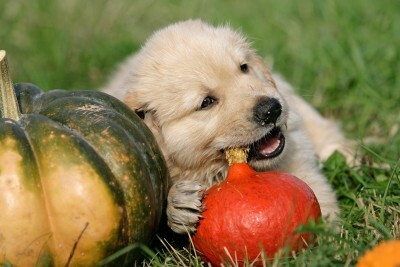 If you take your dog to a pumpkin patch this year, please feel free to share your experience – and some photos too! Tug of War with Dogs? I keep hearing that tug of war is not a good game to play with your dog. However, I have to disagree. While there are many good points about why you shouldn’t play tug of war with your dog, I believe that if you play the game properly none of those reasons matter. Why do people say that tug of war is not a good game to play with your dog? 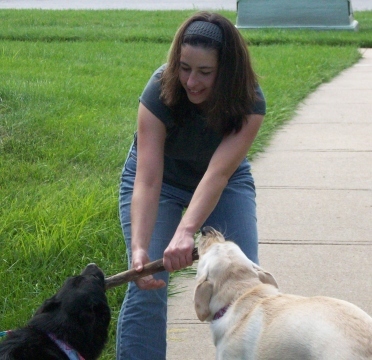 Many people think that tug of war can encourage aggressiveness in your dog. By allowing your dog to play tug of war, your dog may think it is okay to grab something he wants. And if your dog wins at tug of war then you may be allowing him to think that he is the dominant one instead of you. Another reason people say tug of war is bad for your dog is because it may hurt his teeth. To prevent damage to your dog’s teeth, don’t play to rough and stay in control of the game. 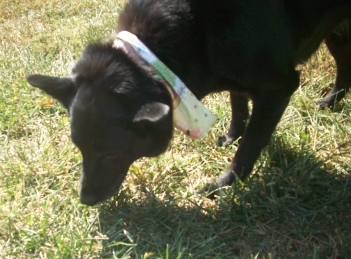 Also play with gentler tug toys like the Fleecy Clean dog toy by Kyjen. Sephi and Maya love fleecy toys and play with them for both tug and chew. Because the Fleecy Clean dog toys don’t break up into stringy pieces, I feel better about them chewing on and playing with them. By establishing rules when you play tug of war with your dog, all these issues can be avoided. The first rule is that you control the game, not your dog. Tug of war should only be allowed when you initiate the game. And the game is over when you say it is over. Don’t let your dog goad you into playing more when you are done. It is okay for your dog to decide he is done playing first, but when you are done that’s it – no more. The second rule to playing tug of war is that your dog must let go when you tell him to. Teach your dog the ‘drop it’ command before allowing him to play tug of war. You want to be sure when playing tug of war with your dog that when you say ‘drop it’ he lets go. If your dog is not consistently good at letting go when you say ‘drop it’ you are going to have a more difficult time being in control of the game if he doesn’t let go when he is supposed to. By being in control when you play tug of war with your dog, you can stop the game if it gets too aggressive or if you think your dog may hurt his teeth. You are also making sure your dog understands you are his leader. He is less likely to exhibit dangerous dominance issues if it is perceived that you are in control. 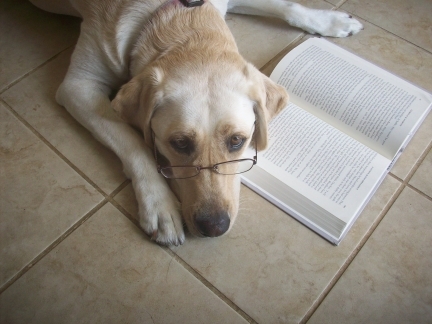 To check out other dog blogs for the Saturday Blog Hop visit AllThingsDogBlog. I know that there should be no words on Wordless Wednesday, but I just couldn’t resist sharing with you how much fun we had at the Dogtoberfest in Lawrence, Kansas this past Sunday! Do your dogs eat grass? If so, how often? Mine eat grass every day. When they eat grass I call them my little cows (likewise, when they scarf down their food I call them my little piglets). I used to be concerned about it because supposedly whenever a dog eats grass, it means their stomach is upset. However, I have recently learned that this is not always the case. If your dog doesn’t normally eat grass, then he may very well be eating it because his stomach is upset. But if he eats grass regularly, maybe he just likes the taste or he is instinctively supplementing his diet with fiber. When the incident with food upsetting Maya’s stomach, the vet said that while it is generally okay for my dogs to eat grass I should keep Maya from eating it while her stomach was in the state that it was. Grass, in her case, may have made her stomach troubles worse because the harsh fibers would cause more irritation. For more information on what it means when your dog eats grass, check out this article – Dog Behavior – Why Dogs Eat Grass. The good news is that Maya will be fine. She has been to the vet and her diagnosis confirmed as due to the food I gave her and not poisoning or Giardia or other parasites. She has been given medication and put on a bland diet. She is feeling a little better today, but if it wasn’t for me she wouldn’t have been feeling bad in the first place. I am so so sorry Maya!! I have learned from this experience and I share it with you in hopes that you learn from it too. Be careful about feeding your dog table scraps. Seasonings which we use on our food may not agree with your dog. There are other people foods which are not good for your dog either. Be sure to consult your veterinarian before giving your dog any food that is not a part of your dog’s regular diet. To teach your dog to catch a frisbee is not as easy as you’d think. This has been a tough one for me. I have tried in the past to teach a dog to catch a frisbee but have never been successful. Even now, I am having a difficult time teaching my dog Maya. She keeps wanting to wait until the frisbee hits the ground, like a ball, before she grabs it. She doesn’t understand that I want her to try to catch in in the air. Since I am having trouble, I decided to peruse the net to find out if there is a better way to teach Maya to catch the frisbee. In my search I found some great instructional videos. By watching these videos, I learned there is more than one way to teach a dog to catch a frisbee. I also learned that even though I am not necessarily doing it wrong, there is a better way. Step number one is to get the right frisbee. The $.99 cent ones at PetsMart are okay to start but may not be the best. For one, they are hard and could hurt your dog’s mouth. I’ve heard that Hyperflite, Aerobie, and the Kong Flyer are great frisbee dog toys. But my only experience is with the Kong Flyer. I really love this one and so does Maya. It is very flexible, soft. Best of all, it is virtually non-destructible which is great since Maya loves to chew on her toys. Step number two is to get your dog excited about the frisbee. There is no trouble there. Maya loves it! Step number three, which may not be in this above video, is to make sure your dog releases the frisbee when you tell him to. Maya does, albeit reluctantly. 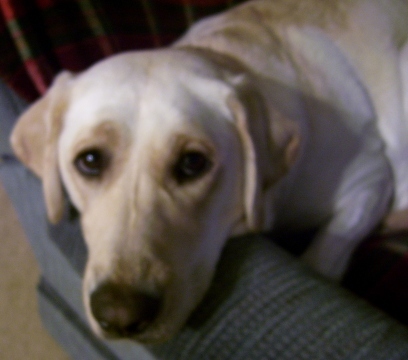 And even though she is a Retriever, she sometimes has trouble bringing it back to me. Step number four, roll the frisbee on the ground. This helps your dog learn to grab it by the rim. I admittedly did not know to do this step. This may have helped Maya learn to catch it before it falls flat. Step number five, teach your dog to go around you so that you have time to throw it. I never thought of this. In fact, I’m not sure it will work with Maya. Yes, I could teach her to go around me easy enough but Maya is slow and I feel like she needs to get a running start after the frisbee so that she can catch it before it hits the ground. If I make her go around me first, then the frisbee will land before she even realizes I’ve already thrown it. However, the Border Collie in this video is definitely a fast dog and so this learning how to go around first looks like it would work. Step number six, teach your dog the ‘catch’ or ‘take it’ command and let them grab the frisbee from your hand. With Maya, I unknowingly skipped steps four and five and went straight to this one. Step number seven, toss the frisbee in the air in front of you and use the ‘catch’ or ‘take it’ command just as he is about to grab it. As your dog gets better at it, increase the distance of the throw. With Maya, because she is slower than that Border Collie, I have been throwing the frisbee at or by her. I have to make her stay at a distance from me, then I toss the frisbee. She has gotten to where she can catch the frisbee in the air 40% of the time, but she is still not running to catch it. I will try some of the tips in this video and perhaps soon I will have a video of Maya for you to see. Does anyone else have any tips on how to teach your dog to catch a frisbee? If you have a video or photo, we’d love to share it! Visit other great dog blogs at http://twolittlecavaliers.com/2011/10/dog-plays-better-basketball-than-you-pet-bloggers-blog-hop.html.